Firm strip agar made from 100% agar weed. The finest strip agar made at an agar manufacturing wholesaler over 100 years in Kyoto: the origin of agar. Almost all the Japanese confectionery shop in Kyoto city are customers of this agar manufacturing wholesaler. The agar weed is harvested around the country and is blended exquisitely. Traditional method is fused with modern technology and makes the strip agar not too soft, not sticky. Comparing with powdered agar and square shaped agar, firmness is easily adjustable even with a small amount from crisp texture to smooth texture like jelly. It is said the strip agar are difficult to cook than powdered agar but once you start using, you will notice the handiness when measuring and dissolving. Snack in the summertime, toppings for salads. It is a convenient health food rich in fiber. 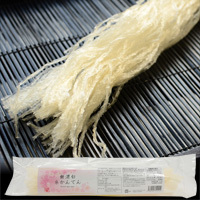 In the Japanese confectionery industry the strip agar produced in “ Kyotamba” are said to be the finest quality. When the manufacture was prosperous in Kyoto Tamba area, people produced strip agar by making the most of the weather by the landform. The traditional strip agar can be made only from pure agar weed 100%. How to store: Keep away from direct sunlight, high temperature and high humidity. How to dissolve in hot water: Soak the string agar (10g) into the water (1L) until softened. Transfer into a pot and cook over on a low flame heat. Please change the amount of agar weed to suit your preferences. ※	We use natural agar so the color, solidification may change. Also the climate when manufacturing may cause a difference to the product. However this does not affect the product quality. Example of usage: Put the agar (10g) into a pot with water (1L) and heat until dissolved. Pour into a container and cool to harden. Cut in to 1cm square shape and serve in a bowl. Pour any syrup and add sweet red beans, fruits of your preference.